The above video shows the overhead sprinklers of our irrigated frost protection system. Up here in the Macedon Ranges we’re far from the mitigating influence of the ocean which means we can have warms days but generally cool nights. This renders us one the coolest viticultural areas in Australia, so around spring and until sometimes late in the year we get our fair share of frosts. The risks are greatest in the September/October when young buds are highly susceptible to frost. The way we counter this is to fight ice with ice. How do we do this? The sprinklers are activated when the ambient temperature drops down below 2 degrees exactly. This gives time for the vines to be coated in water, ready for when the air temperature drops to freezing point. It may seem an odd way to go, but the nature of nature means it can do some wonderfully paradoxical stuff. 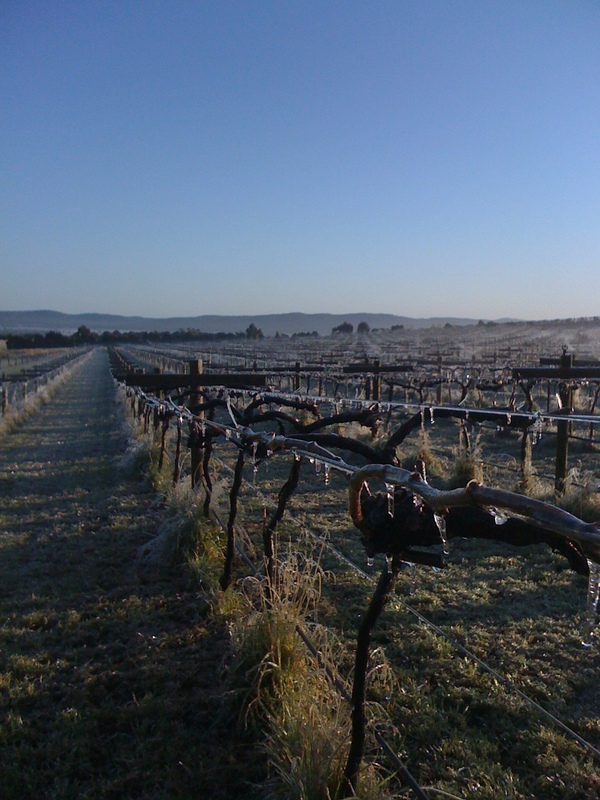 From zero degrees and below, the water coating the vine begins to freeze, as water transfers from one state to another, energy is created which is expressed as heat. This heat is then mostly transferred to the tender buds of the vine, keeping them warm and safe from frost burn. The sprinklers stay in operation so that water is perpetually freezing which not only keeps creating heat but also works at as an insulator. Not all of our vineyard needs frost protection, only the lowest parts which accounts for around 1/3 of the vineyard which equates to around 11 acres. Your welcome, glad your enjoying it! Cheers, glad you think so. We aim to explain only what’s necessary and not to get too carried away, which is easy to do! Not sure where to hire a professional writer sorry, we just write our own stuff.